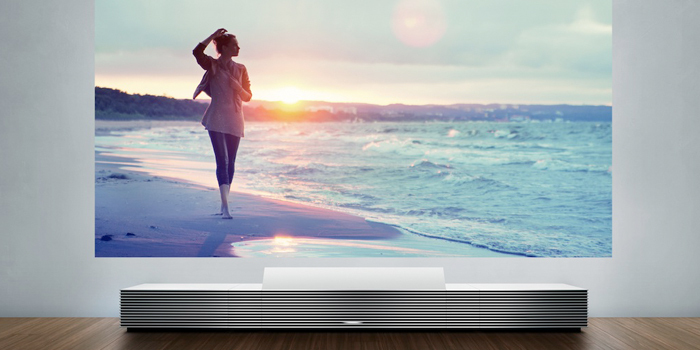 Bring the world of premium entertainment right into your living room with the Sony Life Space UX 4K projector that delivers a stunningly detailed picture — then virtually disappears. Enjoy movies, concerts, art, and more. Your imagination is just the start. It’s not just for amazing movies. One of the 4K Ultra Short Throw Projector’s unique advantages is its ability to project stunning, still photos of anything you wish. A favourite landscape. A dramatic cityscape. A tranquil tropical beach. All within your living room. Now you can step into new worlds…without getting up. Turn your wall into a life-size window to another world. Be moved by scenery, art, movies, or sports with an expansive 147-inch image and 4x the clarity of Full HD. You may forget you’re home. SXRD™ panels give four times the resolution of Full HD — and unlike many projectors that suffer from pixelation at larger sizes, you enjoy the full impact of rich colours and crisp images. The Ultra Short Throw Lens lets you place the projector close to your wall for a giant, 147-inch image. Since it’s near a wall, viewer shadows won’t interfere with the picture, and more floor space is open. Adapt your image size anywhere from 66 inches to 147 inches. The Picture Position Function allows you to instantly zoom in and out to suit your wall space, or what you’re watching. The projector’s laser light source hits peak brightness much quicker than conventional projector lamps. Brightness and colour accuracy are also maintained longer, reducing the inconvenience of lamp replacement. Solid aluminium that’s crisply detailed and exquisitely finished. The cover closes automatically when the projector is turned off, keeping the unit inconspicuous while also protecting its interior from dust. The passive 2-way speaker system hits all the right notes in its blend of appearance and performance; integrated design eliminates exposed cables. The two cabinet units accommodate any additional electronics, providing an uncluttered storage solution for your entire Home Cinema System. Sony’s developers talk about their challenges, goals, and designing the 4K Ultra Short Throw Projector for a fully immersive experience.